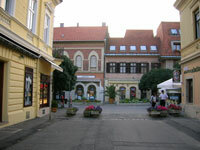 Keszthely is a university town with trendy cafes, tree-lined streets, and busy market areas. Modern history shows Kesthely dating back some 760 years, inhabited since the Roman Empire. Its most import sight is the Festetics Palace, with the Helikon Palace Museum and Library both in one of its baroque wings. Varosi Strand is great for travelling families, with its beach and amusement area. It has water slides, a big pool, and various play spaces, as well as nice lawns, a beach, and loungers. Keszthely likes to describe itself as the capital of Lake Balaton and it is the best town from which to explore the surrounding lakeside area, including the nearby Kis-Balaton nature reserve (excellent for bird watching) and the thermal lake at Hévíz.